Now this is a first - a reader competition on Asian Fashion Blog! 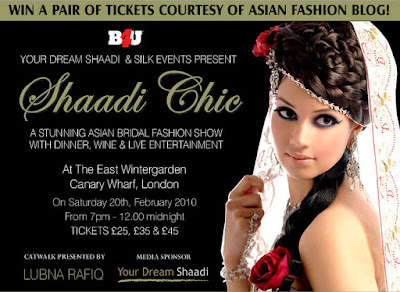 Shaadi Chic is an exclusive fashion show taking place at the East Winter Garden (Canary Wharf) in London on Saturday 20th February. The catwalk show itself has been styled by make-up artist Lubna Rafiq and features a variety of UK-based asian bridalwear designers including RCKC, Amara, SF Collection, Arinder Bhullar and Kyles Collection, as well as a "mehndi catwalk" by the Guiness World Record holder for fastest henna artist - Pavan. The event also includes a 3 course dinner and live entertainment. Fashion, food and a good reason to get dressed up - what more could you ask for! The competition closes on the 6th February so get your entry in asap!